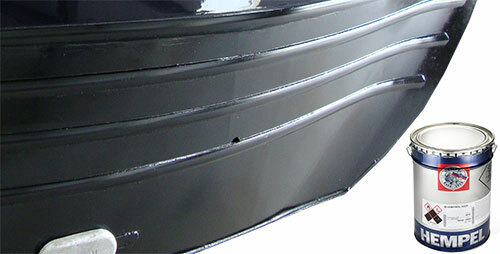 The metal hull of a narrowboat is blacked to protect the bottom section of the boats hull. The areas that should be done are where water comes in contact with the boat including just above the water line. The system called “blacking” protects the hull from rust, pitting, rubbing (through locks, other boats, banks etc) and generally extends the life of the hull. However some firms, or DIY'ers, because they do not have enough equipment, fail to do the bottom or base plate of the boat, which is not ideal. Owning a narrow boat means that you need to carry out various seasonal maintenance jobs and blacking is among one of those jobs. Blacking your narrow boat can be quite time consuming and something that you may not want to do yourself, so may employ a company to carry it out. You will need to take the boat out of the water for the blacking process. There are three different ways used to get your boat out of the water. Dry dock, where the boat is floated into a chamber and then the water is removed. Craning the boat out but can be an expensive option. Slipway trailer where the boat is put onto a trailer and a tractor pulls the boat out the water. This is the most cost effective and popular choice. There are now three basic types of coatings that can be used to "black" the hull, Bituminous and Two Pack Epoxy and now new to the market Molten ZInc with a two pack Epoxy top coat. Epoxy paint will last on its own 5 to 6 years once applied, Bitumen finished coating will last around 2 to 3 years, however with the Zinc and Two Pack Epoxy up to 10 years. If your boat has already been coated with Bitumen you will be unable to put Two Pack Epoxy over the top. To get Two Pack Epoxy on your boat you will need to get the hull “shot blasted” which involves stripping the existing hull back to the bare steel. This process can be a very expensive process and needs to be carried out by a specialised company. How you find out what is on the boat is easy, soak a cloth in white spirit and rub the paint, if the residue is transferred to the cloth it is more than likely to be Bitumen. It is important to check the coating type before you start the process of blacking in order you put the right product on your hull. Blacking needs to be carried out on a dry day as the paint will not dry if applied in the wet and also will not stick if the temperature is too cold. The third NEW method is that of sprayed Molten ZInc. Zinc metal spraying is a highly effective corrosion prevention technology widely used on naval vessels, offshore equipment and civil structures such as bridges. The process can be thought of as being similar to galvanising as it results in a protective layer of zinc being bonded to a prepared steel substrate. Somewhat confusingly, metal spraying is known as a “cold process” despite the fact it involves the application of molten zinc. This is to distinguish it from galvanising, which requires the dipping of steel components in a bath of molten zinc at temperatures of 450C with the associated risk of heat distortion. 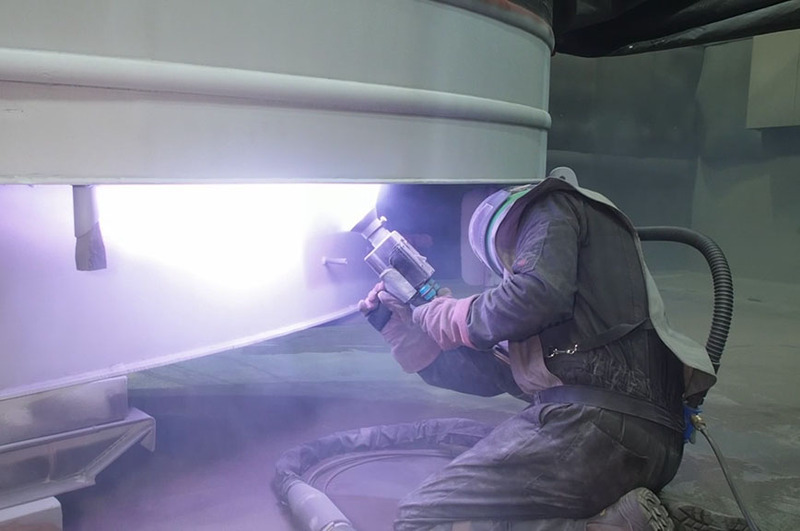 Aside from the impracticability of dipping an entire narrowboat hull into a 450C bath, metal spraying provides similar protection without this risk of heat distortion. How is all this relevant to the narrowboat owner? Well, we’re used to having to fit sacrificial zinc anodes to help protect a narrowboat’s hull from pitting, but we also know how localised this protection can be. Metal spraying effectively turns the entire hull into an anode. This means that when the blacking starts to wear or is damaged by underwater obstacles, the steel is still protected and the risks of pitting are substantially reduced. The process turns your hull a silver grey / colour. The process alone will protect your hull from corrosion, however most people don’t want to cruise around with a silver coloured hull, so after completing the process hulls are normally blacked. This can include a bitumastic product or 2 pack epoxy coating, providing the ultimate in hull protection. A significant advantage of a metal sprayed surface is that it acts like a sponge, soaking up top coats and creating a tremendous bond between the metal coating and paint or blacking. The full process is described here at Debdale Marinas website. We have elected for the Zinc metal spraying and Two Pack Epoxy finish to our boat Valiant No7. I will put a picture step by step the process when we collect the boat mid April 2018 from Debdale Marina. Being a new process, as of going to press, only one other marina at the moment supplies Zinc metal spraying which is Aqueduct marina, however unlike Debdale Mariana who do the whole hull including base plate, at Aquaduct you have to specify the base plate as a covered option. I personally think like those at Debdale Marina that the base plate should be included in ANY blacking program of works. It must be stressed that the Zinc metal spraying will last a long time. However you must inform any hull inspector of the protection NOT to scratch away at the hull to do metal depth tests as it will damage the process.